PENSACOLA, Florida (CNN) -- A fourth suspect has been arrested in the shooting deaths of a Gulf Coast couple known for adopting special-needs children, authorities said late Monday. Police say they have evidence that places Gary Lamont Sumner at the crime scene. Gary Lamont Sumner faces a murder charge for his alleged role in the deaths of Byrd and Melanie Billings on Thursday, Escambia County, Florida, Sheriff David Morgan said. Sumner was pulled over in a traffic stop in Okaloosa County Sunday and arrested after authorities found he matched a description put out by Escambia authorities. 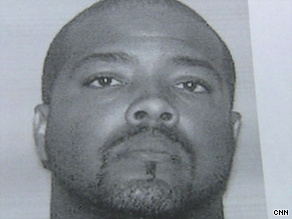 The crime was "a very well-planned and methodical operation," Morgan said. Wayne Coldiron, 41; Leonard Patrick Gonzalez Jr., 35, and Leonard Patrick Gonzalez Sr., 56, were arrested over the weekend. Coldiron and the younger Gonzalez face charges of murder, robbery and residential home invasion; the elder Gonzalez faces charges of evidence tampering for allegedly trying to disguise a vehicle spotted at the home. Morgan said at least three others are persons of interests in the investigation. "We expect more arrests to be imminent," Morgan told reporters. Both of the Billingses were shot multiple times, Morgan said, but he would not release further details on their deaths. Authorities released two surveillance tapes taken from the front and rear of the Billingses' home. Each shows a vehicle pulling up to the property, and five people dressed in black and wearing masks entering the home through two entrances -- including through a utility door left unlocked, something Morgan said is not uncommon in the community. Authorities believe drivers remained in both of the cars. Investigators believe one motive in the deaths was robbery, but "we believe there are other motives," Morgan said. He would not say what, if anything, was taken from the home. Morgan, however, said the couple had a total of 16 children, with two that have died and others that have grown older and no longer live in the Billingses' home. Nine of the couple's children were home at the time of the incident, Morgan said, and police believe three of them saw the intruders. One managed to flee the home and seek help at a neighbor's house, the sheriff said. Coldiron and the younger Gonzalez were being held on $1 million bond, according to records posted on the sheriff's Web site. The senior Gonzalez was being held on $250,000 bond. Police also released a surveillance photo taken at a Wal-Mart in nearby Gulf Breeze, Florida, recently. Two of the people in the photo are Sumner and the younger Gonzalez, but authorities want to know who the other man is, Morgan said. The sheriff called the surveillance tapes "chilling." He noted the vehicles were at the home less than 10 minutes, and the five people were in the house less than four minutes. Although the Billingses were well known in the community, the sheriff said authorities are still trying to unravel why they were targeted. He compared their deaths to the slaying of the Clutter family of Kansas, inspiration for Truman Capote's novel "In Cold Blood," noting the Clutter murders were something the community struggled with for years. "It will be a very long time, I believe, until we piece together the truth of why this family was selected," Morgan said. Police believe the suspects might have bought the clothes they wore to the home and were reviewing surveillance tapes and photos from several stores, he said. Morgan said the crime's complexity is frustrating for investigators, comparing it to a complicated mathematics or word problem that lacks complete information. "It seems as though each phase we complete, while we answer a set of questions, it opens up an additional set of questions." Earlier, he said the complete story, when revealed, is "going to be a humdinger." Asked whether the suspects entered the home planning to kill the couple, Morgan said authorities do not know. Markham said earlier the family does not know any of the three suspects. She said the children "are coping very well" and are being cared for. "They haven't asked too many questions," she said, noting that several have disabilities. While the investigation continues, the family is keeping the children's whereabouts a secret.